Thyme is used as a culinary herb to provide added flavor to a variety of dishes. It's available in both fresh and dried forms, but fresh thyme is thought to be far superior in flavor. 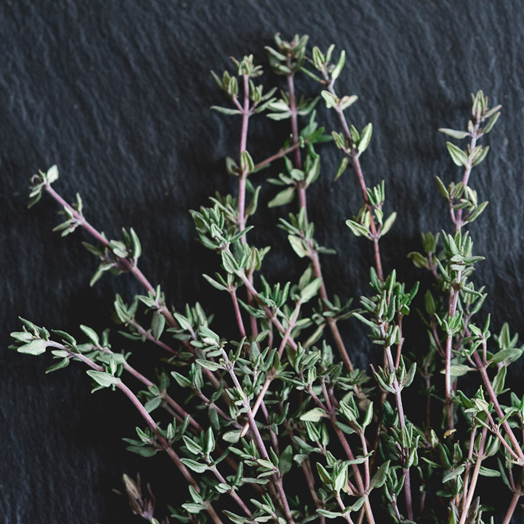 Be sure to add thyme towards the end of cooking, as heat can cause the herb to lose its delicate flavor! Herbs in a plastic clamshell package actually keep well for a few days in the clamshell package in the refrigerator. If your herbs didn't come in a clamshell package, trim the stems then place them into a jar with about an inch of water in the bottom. If you need to refrigerate the herbs, place a plastic bag over the herbs/jar and then refrigerate.